Family Volley: FAMILY FUN FRIDAY - THE BEST Game! 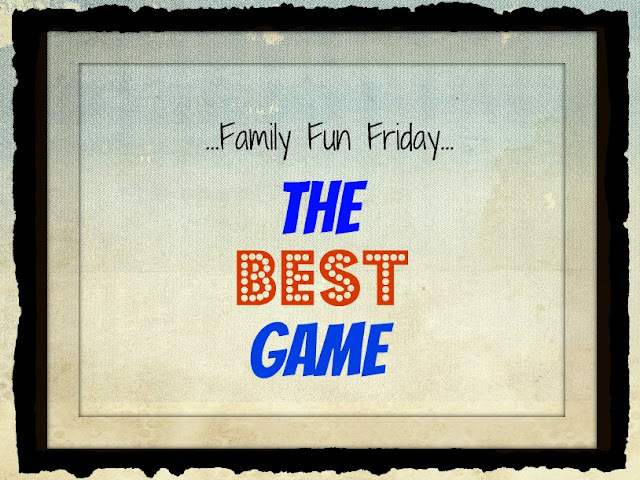 FAMILY FUN FRIDAY - THE BEST Game! Just can't say it enough, This game is really fun. The MATERIALS will depend on what you do in your family. You can also play with no materials at all. Keep reading, you will see what I mean. You will want to choose a Host. Then, if your family or group is large, arrange everyone into groups. If you are smaller, then everyone can play as their own team. If you are playing with lots of people the rule stands that everyone has to participate in at least one round. Then, each group will select one person who they think will win the category. There will be a category contest and if a person has "THE BEST" within the category, his or her team gets a point. SO this is how it would work. The Host would say "The Tallest". Then, if you are in groups, each group would pick the person they think could win "The Tallest". One person to represent the group. Then, Once every group has their representative, or each individual is ready, The Host will then announce what has to be done. For example, with "The Tallest", then the Host could say, "The Tallest...Thumb". Everyone playing that round would come together to see who had the tallest thumb. That person would then get a point. Here are some category and contest examples. Use these, and add your own. -The Quickest....TO BALANCE 5 DICE ON THE END OF A TOUGUE DEPRESSOR HELD IN YOUR MOUTH. -The Farthest....MAKE A PAPER AIRPLANE AND SEE WHO'S GOES THE FARTHEST. -The Biggest....WHO CAN BLOW THE BIGGEST BUBBLE. As you can see, the possibilites are endless. You can make them as complicated or basic as you would like. You will find your family/group, laughing out loud. What are you The Best at? Do you have the tallest thumb?